In planning my 2017 Travels in my Prius, I wanted to find a way to cook rice on the road without setting up my stove and sauce pan to cook the rice when I am not in need of cooking other food. I enjoy my RoadPro 12 volt 20 oz water heater so I decided to look for a 12 volt product to cook rice. The reason I don't use the RoadPro 12 volt water heater is that at the bottom of the RoadPro the heating element is immersed in the liquid and cooking rice means that the rice would get attached to the element. It took some research to find the 12 volt rice cooker in the picture above. I checked Amazon and eBay but found nothing. I finally found this product on AliExpress for under $30.00. They make the rice cooker in different voltages. Here my packaging shows that it also comes in 24 volts and the website also had 120 volts and 220 volts. Of course, running this product off of 12 volts is more efficient than running it at 120 volts off the inverter. Size was also important to me living in my Prius. 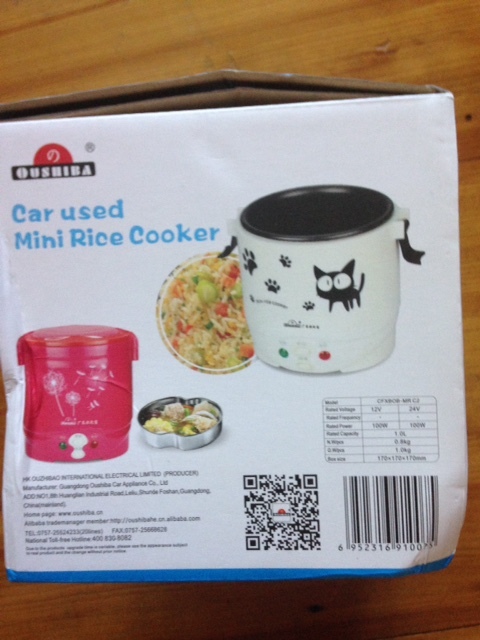 I was happy to find this product was a mini rice cooker. Thus the size should be accommodated in my Prius travels. In the case of the rice cooker it is not a need but a want. I have lived in my Prius for 4 months for two separate years and didn't have a rice cooker so I can live without it, but I wanted to try it. This 12 volt rice cooker comes with a small pan on top and this can be used like a double boiler, with the rice on the bottom and a small piece of fish or some chicken cooking on the top. Remember that this is small and will make rice for two but the top pan will cook about enough fish for only one. 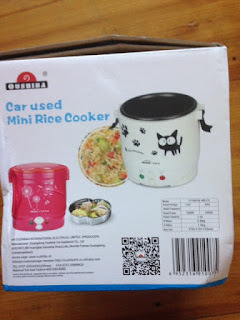 The rice cooker accessories come inside the bottom of the pot, except for the serving spoon that is supplied in the box.. Check out the handles that flip up from the lid. This makes moving the rice cooker when hot easy without pot holders. The cooker is 6" tall and 6" diameter at the widest part clip to clip. Above is the serving spoon supplied with the rice cooker in the box but does not fit into the rice cooker for storage. My test of cooking rice was done with a spare Prius AGM 12 volt battery. As I said above the serving spoon would not fit in the rice cooker so a little sanding on my belt sander to the plastic spoon allows me to store it int he pot with the rest of the accessories. Here are all the accessories now stored in the bottom of the pot including the spoon. Finally the top of the rice cooker is clipped on and I am ready for the road. Note the small vent hole on the upper right corner with writing that says caution hot. Another consideration is how many amps does it draw for my Prius 12 volt power system. I fuse my 12 volt Prius circuit at 10 amps. A test shows the rice cooker draws just under 7 amps. Note that cooking in the rice cooker is not as fast as heating water and cooking on my butane stove, but it gives me flexibility in cooking options. It took me about 30 minutes to make rice. Of course I will use this cooker on the Prius 12 volt system that I have wired in the back of my Prius with heavy wires to prevent power loss, while the Prius is in "Ready Mode" so the 12 volt Prius battery is not depleted. Just as I do when heating water with the RoadPro water heater. Since the rice cooker has a wide bottom and sealed lid it will be ok to use while driving. Thus I can plan and have my meal ready when I arrive somewhere and if it is bad weather conditions for cooking with the stove I have the ability to still cook a meal inside the Prius. After getting my rice cooker I was able to think of other usages of the cooker beyond the rice and cooking meat or fish on the double boiler. Since the inside is coated for easy cleaning, there is no reason whey I can't heat canned soup, make prepackaged dry soups by adding water, cooking beans and cut hot dogs, oatmeal cereal, and so on. Here is my finished rice and I am ready to use my 12 volt rice cooker on my 2017 travels. I have seen a couple of nomads cooking into their Prius, question: how heathy to your car's inner liners will the humidity from the cooking would be ? Just wondering about it. You are right to ask this question about humidity in the Prius. I do not cook with open flame in my Prius. I only cook with hot water and have thermos cooked with hot water or made cold sandwiches. Heating water with my RoadPro water heater has little humidity as the pot is covered when boiling. The new rice cooker is the same while cooking it is covered. So there is very little moisture that gets into the Prius. When I cook with my butane stove I use my custom tablecthat fits in the rear door frame seen in this blog. When I have a picnic table I use that instead. The largest moisture producer in the Prius is bathing in the car. When it is warm I crack the windows to wash and when it's cold I use the Prius the heat the inside. Either way the moisture escapes and does not create any problems in the 2 years I have traveled in the Prius. I find the most interior condensation is in the morning from sleeping at night even with the windows cracked. I have a towel handy to wipe down the inside of the windows when I get up if condensation has formed. You guys, Prius dwellers, truly amaze me I can't imagine how I could cook, sleep & bathe in such small space; I figure you'll must be contortionists to perform all of those tasks, back-pain free. There is no way in heaven I myself could do it... I would need to call 9-1-1 for them to ' extract me out of the car twisted like a pretzel ' LOL. Good for you amigos, you can make in a Prius...more power to you, enjoy !!! You bring up a reasonable concern about doing all those things in a Prius. After my first year of travels in my Class B at 10 mpg I went way out on the belief I could live the same way in a Prius. I sold the Class B and found my used Prius and started my design. It was December 2014 and I was leaving in a month and I was ready to try my first overnight in the Prius. Although I did it I had reservations and as I lived in my Prius for the first time away I thought it would become claustrophobic for me and I would have to abandon my travels and head home with shame of failure. Every day things got a bit easier and after 2 weeks I was comfortable and knew I could do it! A couple others who lived in their Prius before me gave me inspiration. I wasn't a leader but a follower. Suanne who has been doing it for 6 years in her blog was straight up right that you need a place to sit and sleep in the rear. This does two things. I can just sit in private before going to bed. It also gave me a place to dangle my legs over the edge f the bed to make getting dressed so much easier. Certainly the Prius Campervan life isn't for everyone, but for those who choose it, my goal is to help them with this blog On how to do things. Hi Brent, you are right we are all different, in my case even though I wish I could use the car for camping I just can't & is basically due to the fact my back is in pretty bad shape. 2 lumbar vertebrae thin & ' holy ' are not a joke. Thank you for answering my questions. I believe the Prius is such an amazingly built machine & its gas milage is hard to bit. Very good detailed account with good info for any nomad, Brent. I'm considering one of these when I get back on the road. Thanks much! I plan to write a blog about the mini rice cooker after I'm on the road again and have used it a few more times. You may already know this but I will cover for others that read this comment. As with all 12 volt appliances/cookers I run a separate circuit from my battery using 10 ga automotive wire fused at 10 amps. The shorter the wire run the better for losses. Many recommend Anderson Power Poles to be able to directly wire the appliance to the circuit after cutting off the cigarette plug. There are losses through heat at any cigarette connection on higher current appliances. If you use a cigarette plug make sure it is heavy duty such as what blue seas sells. Thanks for your detailed blog posts which I hope will help me one day to have a similar setup like yours and travel. Yes my fellow Prius dweller Dave uses an induction cooktop and pressure cooker and he enjoys cooking that way. You do need a different setup and I agree with Dave's fixed location, having removed his fixed front seat. For my desire to have a front seat where I can travel with someone there is no fixed location for effective inductive cooking. When I want to cook beyond my 12 volt pot cooking I bring out my stove and cook with pots and pans. I don't find this a problem. What you need to decide is what your priorities are and move in that direction. I also look to have a more standard look from the outside of my car for stealth purposes. I hope this helps. It comes down to a matter of choice.